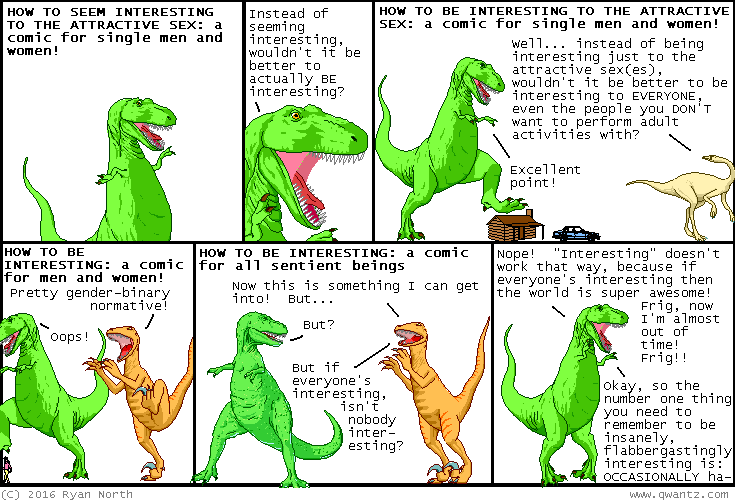 Dinosaur Comics - May 11th, 2016 - awesome fun times! –He walks on my damn carpets with his damn shoes on! May 11th, 2016: I started this comic in 2012 and saved it till now! It was a "emergency comic" in case I ever needed a day off, and it turns out after two weeks of travelling, I TOTALLY DID. Thanks, 2012 me! You really had 2016 me's back. KEEP IT UP (he did not keep it up, this is the only such comic I had). One year ago today: yesterday i realized two things: i am an adult, and this is Not Going To Get Better.